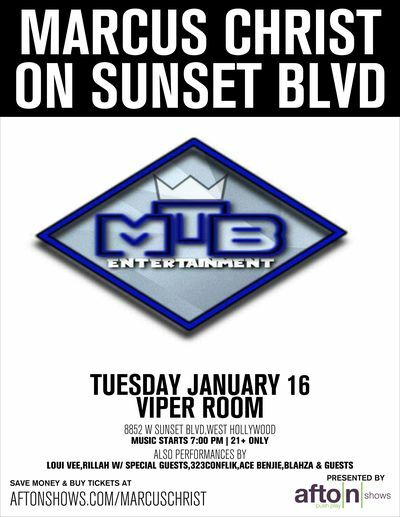 MtB Entertainment's Marcus Christ to perform LIVE on SUNSET BLVD January 16th!! Marcus Christ performs his new singles, "Hate on Me", "You Knew That", and "If I Knew"!! LIVE ON SUNSET BLVD!!! His upcoming album "Prince of the Universe" FOR SALE 4/3/2018!!! HOLLYWOOD, Calif. - Dec. 27, 2017 - PRLog -- Marcus Christ will performs his new singles, "Hate on Me", "You Knew That", and "If I Knew" LIVE ON SUNSET BLVD!!! His upcoming album "Prince of the Universe" is scheduled to be released on 4/3/2018 after a legal issue caused a delay! This performance at the historic Sunset Blvd will be the first professional act on stage from MTB Entertainment's flagship artist Marcus Christ. Recently Marcus Christ gave away a free download of "The Day That You Told Me (2018)", but the song wasn't cleared by the producer of that beat. Marcus stated, "It's really a shame cause that is one of my favorite songs, but since I can't sell it I can give it away." Marcus Christ is known to give out music for free with download cards, or cds but this performance will likely be attended by music scouts. This show can be the catapult that we need to show to amazing talent Marcus Christ has". "MtB Entertainment will likely compete with Warner Bros, Disney, and Universal in the future. The smallest seed can become the biggest tree. ", Marcus said. You Knew That is produced by Lil Tray Beats, If I Knew was produced for Shadowville Productions by Nime Five, and Marcus Christ produced Hate On Me. I'm Really excited about this show if I can stay out of jail I think it'll be a hit. I had the email last week, but the date was so close I hesitated, but I signed the contract today so I'll be there. When a opportunity presents itself I think one should take it. My next album American Pharaoh should have 100% of my production (beat) (hopefully). I hope I can give everyone a show to remember." Marcus Christ will release his double disc album Prince of the Universe on April 3rd, 2018. Jesus Christ Sues The Vatican For Trespassing And Bank Fraud For $5 Quadrillion! MtB Entertainment Sues Motel 6 In Buena Park For Racial Discrimination Demanding $15 Billion! MTB Entertainment Threatens Legal Action Against Planet Fitness For Racial Prejudice!